Paper Tales, that's a new card game from the small French publisher CATCH UP GAMES, distributed by BLACKROCK GAMES. What would you expect from the title? A game about the history of paper making process, that was my first thought. But that was totally wrong! In Paper Tales the time of relentless heroic wars comes back alive. Two fantastic centuries have to be experienced in only four quick rounds. 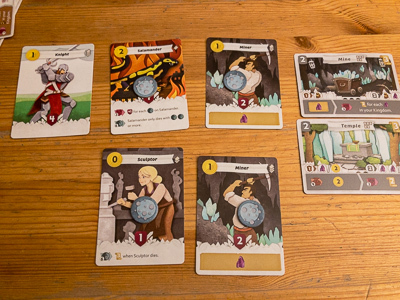 And this time is no peaceful one: In the game, the players choose units for their armies and send them against their opponents each round of the game. Each of the four rounds consists of six phases that are played simultaneously and successively. In the first phase, all players get new unit cards. This is done in a drafting round, comparable for example to Seven Wonders. Five new cards are dealt to each player, one card is chosen and the rest is passed on. Then one more card is chosen out of the remaining cards and again the rest is passed on and so on. Each unit has its individual deployment cost, a strength for the battles, and sometimes also special abilities and resources that this unit produces. In the next phase, new units can be played from the hand to our Kingdom on four spots in front of each player, if there is not already a unit from previous rounds (you can discard cards in this phase too). But of course units are expensive and so a player has to pay the deployment costs to play them. On the one hand those units are fighting for us. On the other hand they also can provide the player with new income and resources, so to choose the best-fitting units is the most important thing in the game. But before we can collect our income, it is time to activate our units and send them to war. Every player simultaneously fight two battles, one against each of his two neighbours (in a two player game you only fight one battle). To find the winner, each player determines the strength of his or her two units in the front spots, and the Kingdom with the highest strength wins the battle. Of course, a player can be the winner on the one side of his Kingdom, while he looses on the other side. Simple, but effective, and as a result, players get three victory points for every war won. As a result, a player can win a maximum of 6 victory points out of the wars in one round. Last but not least in a round, our units grow older, called Aging in the game. One Age token is placed on every active unit card, but if a unit already has a token at this very moment, it dies and is discarded. Normally this is bad, because you are forced to play new units in the next round (which cost you money again), but some abilities of the units can prevent the dying of other units, and there are also some units that profit by the dying, in the form of additional victory points. If you play Paper Tales for the first time, the end often comes surprisingly, after about 30 minutes. Although you think that you still have to construct and update more of the available buildings, there is definitely no time to do so. There are only four rounds and so you normally end up with only two or three buildings. Of course, this is intended by the authors. 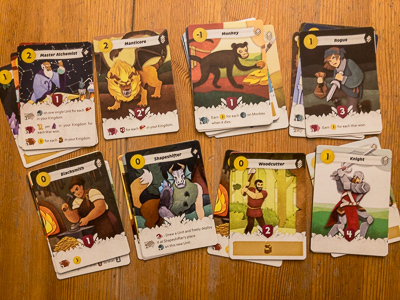 Paper Tales is no extensive building game, but it is the players' task to find the best strategies that fits to their hand cards. In the one game, it is best to construct a town, which produces a lot of resources you can use for further buildings. 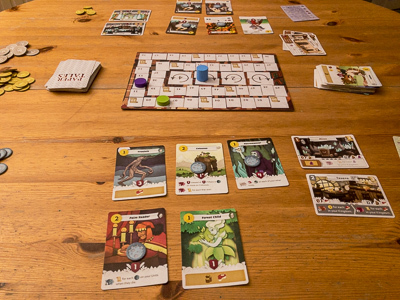 In another game, an early tavern in level two, could be the wiser choice, as it gives you one victory point for any meat in your kingdom each round of the game. As you can see, the type of building will also influence your choice of units, because you immediately participate from what they produce. On the other hand, that's a fact that your opponents will try to prevent. As a result, you might not find matching cards in later rounds, because another player snatches the card from under your nose, just to prevent you to take and use it. 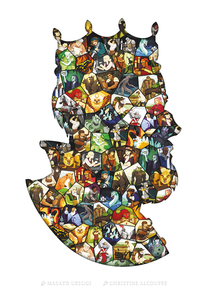 In my opinion, Paper Tales is one of those hidden gems that is drowned by the sheer mass of new games every year. CATCH UP GAMES is a very small publisher, but the game is also distributed by BLACK ROCK GAMES. I personally really like the artwork of the cards (a kind of comic style) and the quick gameplay, combined with the short game duration. There is more to think about than you would expect after a first look at the rules. Paper Tales offers a lot of tactical choices, especially if you pay attention to what your opponents are doing. I think the game is best with three or four players, but I also enjoyed the two player variant.